You probably have heard of Blue Apron/Hello Fresh/Freshly, or probably even tried it. If you have tried it, like most people, you probably stopped using it, because it still takes a long time to cook and it is not inexpensive. Well...there is now a better alternative. 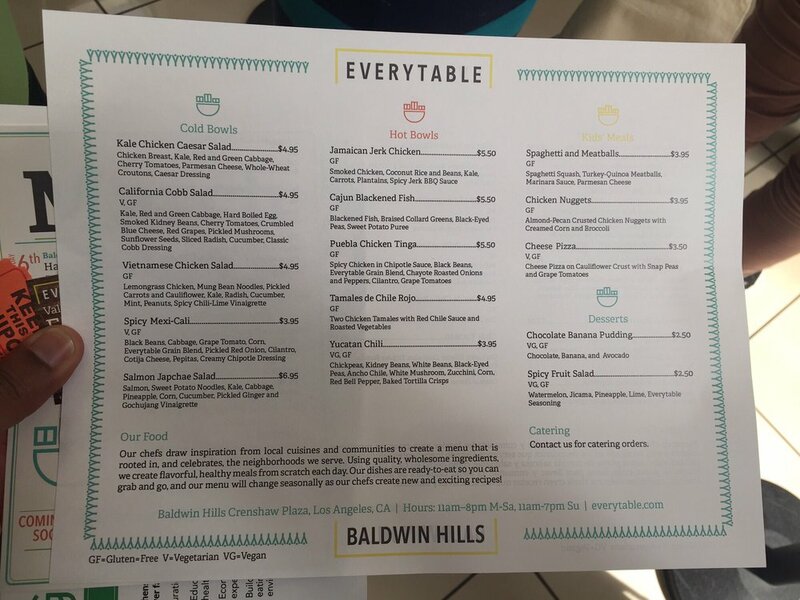 If you want to save time, save money, eat healthy and happen to live in Los Angeles, I have found the perfect solution for you: EveryTable (not sponsored). Everytable is an affordable, healthy, ready-to-eat food service company with locations in Los Angeles. Yes! affordable, healthy and no need to cook, all in one! I especially love their mission statement. Our mission is to make nutritious, fresh food affordable and accessible to all. WHAT EXACTLY IS ON THE TABLE? Everytable provides cold bowls (salads), hot plates, kids meals and desserts. I have tried them from the Baldwin Hills location. I believe the highest value comes from the hot plates, then salads. Attached is the menu from the Baldwin Hills location. As you can see, pricing is typically around $5. Everytable adjusts its pricing based on the community it serves. They truly stand behind their mission with action. Love it! Most locations charge $5 per hot plate.Even the pricing on the Westside is very reasonable at $8. Below is a simple map that shows their pricing and locations. Even the pricing on the Westside is very reasonable. Most locations charge $5 per hot plate.Even the pricing on the Westside is very reasonable at $8. Hands down, Everytable is the best solution to save time, save money and eat health. Unfortunately, if you live outside of Los Angeles, you are out of luck for now.